Take performance to the next level with RocketBladez Hybrid/Irons. Rescues feature a sleek, compact head shape and thinner, faster-flexing faces to promote remarkable confidence and distance. Both rescues and irons feature a Speed Pocket behind the face to optimize face flexing, feel and performance. Each iron features an advanced, ultra-thin face design coupled with Inverted Cone Technology to enable maximum playability and forgiveness. I've had mine for two years now. 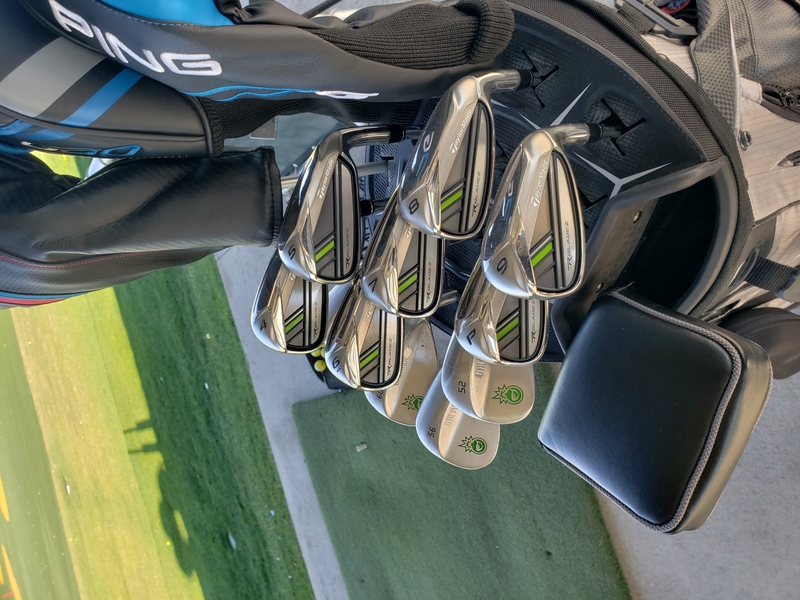 The best irons I have ever owned! Great feel, not too big, not too small. When I put a good swing on it, the ball go's dead straight at the pin! I had them bent 2 degrees upright to fit my swing. Not looking to replace these irons anytime soon! They are very easy to hit. I gained 10 yards per club. Just what I was looking for at a great price. I have only played one round with these clubs but I can tell you, "Wow, what a difference." I used the four iron to tee off on every par 4 / 5 and that baby went high. Not much roll after the fact but we had just gotten a shower the night before. My high school son even commented on the flight of the ball. I normally hit my 5 iron 185yrds. With the RockBladez 5 iron it was flying close to 200. Besides the height difference, I also noted that off-center iron shots went straight and didn't lose much yardage. I purposely tried to toe a few shots (and with the moisture on the grass, I could verify a mis-hit). Those shots went straight and with similar distance as a flush strike. Overall, I look forward to playing these a lot. Rock Bottom was awesome and I couldn't be happier. ConsOnly thing I would comment on would be that you may have to readjust your setup. I ended up moving a touch closer to the ball for better contact. Love these irons, light weight easy to hit very forgiving. Love the look and feel of these clubs and couldn't pass up the great deal. Taylormade rbladz are the real deal. Really like the Rocket Bladez irons. They have a great feel and an excellent price. ProsVery forgiving compared to my Muzino MX-20?s.